Summary This article describes how to setup an active directory-based single-sign-on. 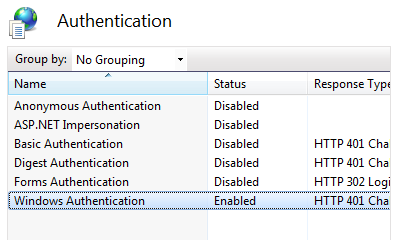 What is Single Sign On ? And what is Active directory? 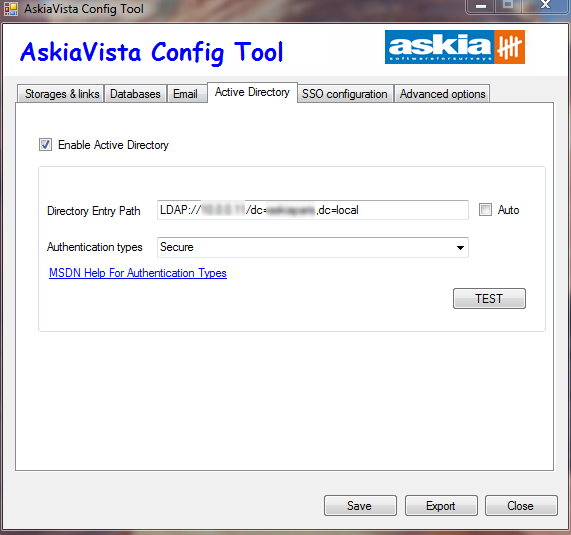 So, basically, setting up this Active directory based SSO will allow your internal users (those who are registered on your Windows domain via Active directory) to be automatically signed in to askiavista. Thus avoiding having to sign in each time they connect to your askiavista setup. In IIS, disable "Anonymous authentication" and enable "Windows Authentication" in order to retrieve the SAMAccountName in AskiaVista. Open AskiaVistaConfigurator.exe (located in the ./AskiaCtrl folder) and browse to the Active Directory tab. Specify the LDAP path in the Directory Entry Path field and the Authentication type in the relevant dropdown menu. 2Path = "LDAP://CN=<group name>, CN =<Users>, DC=<domain component"
3Path = "LDAP://CN=<full user name>, CN=<Users>, DC=<domain component"
4Path = "LDAP://CN=<computer name>, CN=<Computers>, DC=<domain component"
5Path = "LDAP://CN=<computer name>, CN=<Computers>, DC=<domain component"
6Path = "LDAP://CN=<user name>,OU=<Organizational Unit,DC=<domain component"
7Path = "LDAP://AD_SERVER/CN=<user name>,OU=<Organizational Unit,DC=<domain component"
. Once it's validated askiavista searches the askiavista DB to check if the SAMAccountName exists (using the SAMAccountName in the AV_Users table). If the user exists, he will be automatically connected to askiavista.